Through the Sustainable Saratoga Urban Forest Project I have become aware of the locations of the few elm trees that survived the elm blight many years ago. This one, seen in late afternoon light from Broadway next to the Collamer building, has always impressed me with its exuberant shape – able to spread out into the space and be seen from many different angles. The city fireworks used to go off near-by and in summer this tree’s appearance evokes those fireworks. The exhibition listed on the home page and in the side bar, will include other angles of this tree as well as other elms. 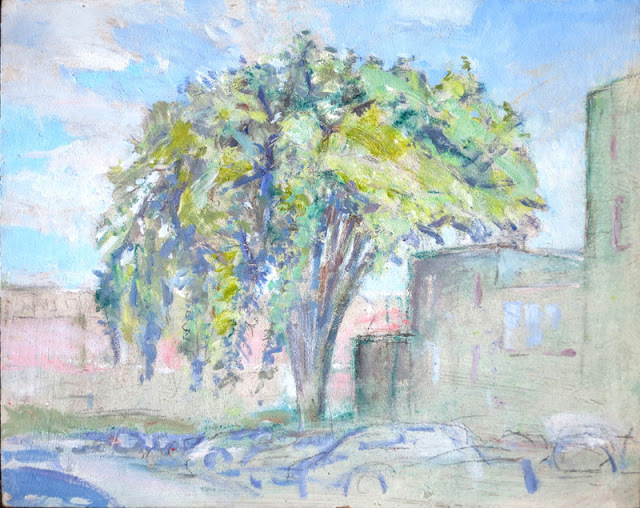 The choices made in the composition and the coloration, emphasize the role that the tree plays in the actual landscape, softening the visual impact of the parking lot by adding a strong distraction and carrying our eyes above street level. By only suggesting the forms of the cars and the buildings, I have created the visual equivalence of that relationship – so that only curves and rhythms are seen in the cars and the building is subdued so that it provides an interesting silhouette for the tree to escape from . The choices for the sky details further emphasize the energizing aspect of the tree.